The KwaZulu-Natal Premier, Willies Mchunu and the MEC for Transport, Community Safety and Liaison, Mxolisi Kaunda convened a meeting with truck drivers to provide feedback on the interventions government has put in place to curb the employment of foreign national truck drivers in the freight and logistics sector. The meeting follows a series of engagements with local truck drivers after they embarked on illegal protests against the employment of foreign truck drivers. The violent protests which took place in Mooi River and Van Reenen early this year resulted in the damage and looting of over 30 trucks along the N3 in Mooi River. The Meeting which was also attended by the Department of Home Affairs and Labour, received a report that since the last meeting the Premier convened with the local truck drivers and employers in June, a number of law enforcement operations have been conducted in companies which illegally employ foreign truck drivers. The Department of Labour indicated that since June, over 47 inspections have been conducted in companies which were reported to be flouting the law. The Department of Home Affairs also reported that their immigration officials are conducting operations on a weekly basic across all freight and logistics companies in the province. The Premier said that whilst progress has been made in addressing the issues raised by the local truck drivers but much more still needs to be done. He urged the Departments to find innovative ways to deal with the issue of companies who continue to flout the law by employing foreign truck drivers. “As the provincial government, we sympathise with the grievances raised by local truck drivers and we call upon them to be patient as government is working around the clock to address their concerns,” said Mchunu. In charting the way forward, Mchunu said the key to solving the challenge was tight border control. He said that the Departments of Home Affairs and Labour must beef up their inspectorate units with both human resources and tools of trade to ensure that law enforcement operations are conducted regularly. “All relevant departments will work collectively to intensify joint law enforcement operations which will be monitored by the workers. 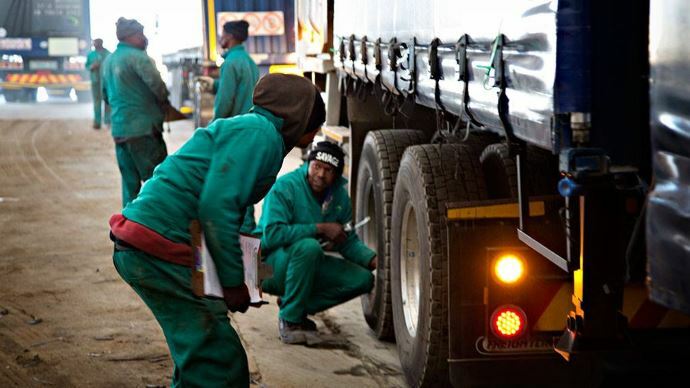 Department officials must work closely with representatives of truck drivers to address all challenges facing workers in the freight and logistics sectors including poor working conditions and exploitation by employers,” said Mchunu. In ensuring substantive compliance with the law, Mchunu urged the law enforcement agencies to impose heavy penalties on companies that are flouting the law. We have also agrees with the Department of Labour that their inspectors must urgently attend to personal complaints raised by the workers. For instance, some local drivers are paid below the minimum standards set out by the bargaining council of R10182 per month. This will also address the issue of the spate of unfair dismissals, which are widespread within the sector,” said Mchunu. He further instructed all relevant departments to submit progress reports on monthly basis to the office of the Premier for monitoring purposes.